In 2015, the All-Sky Automated Survey for Supernovae (aka. ASAS-SN, or Assassin) detected something rather brilliant in a distant galaxy. At the time, it was thought that the event (named ASASSN-15lh) was a superluminous supernova – an extremely bright explosion caused by a massive star reaching the end of its lifepsan. This event was thought to be brightest supernova ever witnessed, being twice as bright as the previous record-holder. But new observations provided by an international team of astronomers have provided an alternative explanation that is even more exciting. 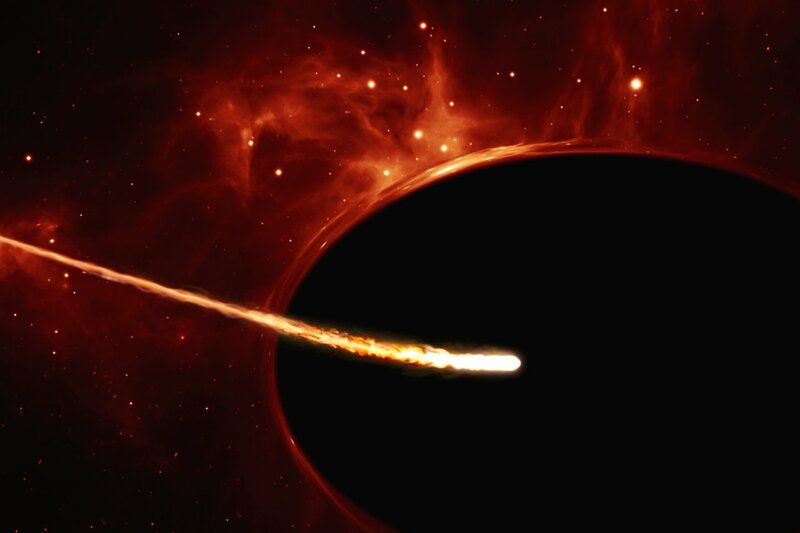 Relying on data from several observatories – including the NASA/ESA Hubble Space Telescope – they have proposed that the source was a star being ripped apart by a rapidly spinning black hole, an event which is even more rare than a superluminous supernova. According to the ASAS-SN’s findings – which were published in January of 2016 in Science – the superluminous light source appeared in a galaxy roughly 4 billion light-years from Earth. The luminous source was twice as bright as the brightest superluminous supernova observed to date, and its peak luminosity was 20 times brighter than the total light output of the entire Milky Way. What seemed odd about it was the fact that the superluminous event appeared within a massive, red (i.e. “quiescent”) galaxy, where star formation has largely ceased. This was in contrast to most super-luminous supernovae that have been observed in the past, which are typically located in blue, star-forming dwarf galaxies. In addition, the star (which is Sun-like in size) is not nearly massive enough to become an extreme supernova. As such, the international team of astronomers – led by Giorgos Leloudas of the Weizmann Institute of Science in Israel and the Dark Cosmology Center in Denmark – conducted follow-up observations using space-based and Earth-based observatories. These included the Hubble Space Telescope, the Very Large Telescope (VLT) at the ESO’s Paranal Observatory and the New Technology Telescope (NTT) at the La Silla Observatory. The process is colloquially known as “spaghettification”, where an object is ripped apart by the extreme tidal forces of a black hole. In this case, the team postulated that the star drifted too close to the supermassive black hole (SMBH) at the center of the distant galaxy. The resulting heat and the shocks created by colliding debris led to a massive burst of light – which was mistakenly believed to be a very bright supernova. Multiple lines of evidence support this theory. As they explain in their paper, this included the fact that over the ten-months that they observed it, the star went through three distinct spectroscopic phases. This included a period of substanial re-brightening, where the star emitted a burst of UV light that accorded with a sudden increase in its temperature.